Posted on December 11, 2015 by Aarti Bhavana. This past year has seen a lot of discussion on enhancing ICANN accountability, especially in the context of the IANA Transition. The Cross Community Working Group on Accountability (CCWG-Accountability) has been working on various proposals, which were developed to propose reforms to ICANN’s accountability to the global multistakeholder community, in the absence of NTIA oversight. CCWG-Accountability opened its 3rd draft proposal for a 21-day public comment ending on 21st December. This group has been working on a very tight schedule to ensure that the proposal is approved by the Chartering Organizations and sent to the ICANN Board for transmission to the NTIA, all in time for the transition next September. In the current proposal the community enforcement mechanism has shifted from the ‘Sole Member’ model a ‘Sole Designator’ model. During the previous public comment period, concerns were raised that certain non-waivable statutory powers provided to members by the California Code, such as the power to dissolve the corporation, were too broad. Therefore, the CCWG-Accountability changed the model to that of a designator, which is very close to the present structure of ICANN. The Sole Designator will be a California-based unincorporated association (Empowered Community) consisting of representatives of the participating Supporting Organizations (SO) and Advisory Committees (AC). The only statutory power given to the Sole Designator is to appoint or remove an individual director or the entire board of directors. In addition to this power, CCWG-Accountability also proposes giving the Sole Designator the power to inspect ICANN’s financial records, as the community stressed the necessity for this. The Empowered Community and its governing rules shall be incorporated as fundamental bylaws, which cannot be changed without its own approval. The Triple-E Approach was developed in Dublin to institute a requirement for the ICANN Board to engage with the community on any key decision that could potentially invoke the use of the community powers, through the three-step process of engagement, escalation and enforcement. Engagement refers to a public consultative process to gather community input before the Board takes any action on ICANN’s Strategic/Operating Plan, annual budget, IANA functions budget, modifying any bylaw, or reviews of IANA functions. 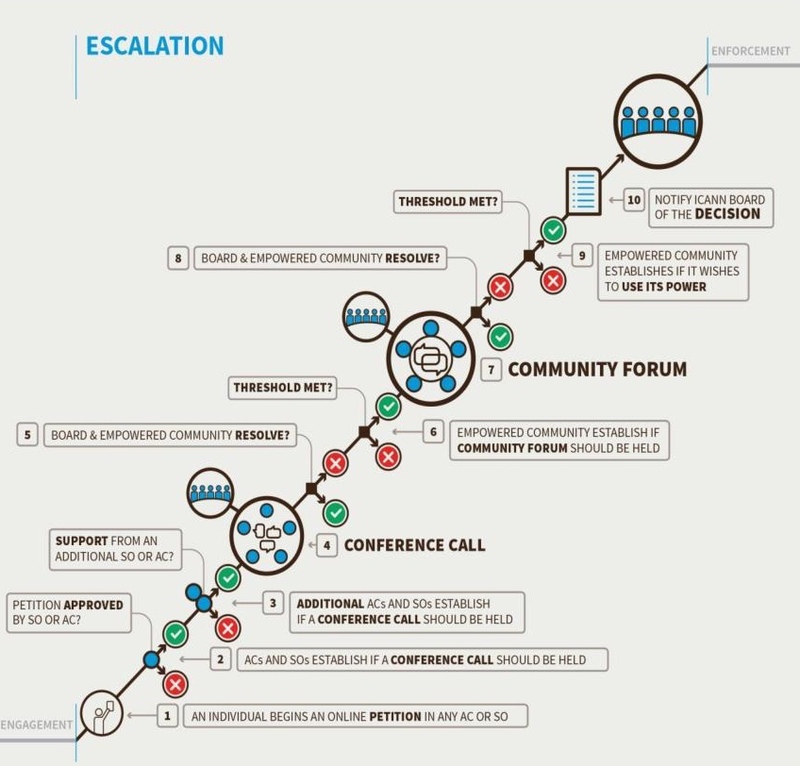 Escalation consists of a series of steps, as visualized below. There must be certain thresholds of community support to move from one step to the next. Enforcement shall be considered only if the ICANN Board does not comply with the empowered community’s decision to use a particular power. At this stage, there can either be a mediation and community Independent Review Process (IRP) procedure, failing which the community can either approach the court or use its power to recall the entire ICANN board. Alternatively, the community can choose to directly invoke its power to recall the entire board, if it achieves the necessary community support. Another change since the second draft proposal is the shift from voting to consensus model of decision-making. The change to a consensus model also means that the weighted/fractional voting system proposed in the 2nd draft has been dropped in favour of a single decision system wherein each SO/AC will decide its position internally through a process of its choosing, and express the outcome of this process as its decision. The CCWG- Accountability recommends splitting ICANN bylaws into ‘Fundamental Bylaws’ and ‘Standard Bylaws’. Fundamental bylaws are harder to change, and include The Mission, Commitments and Core Values, the seven community powers, and the framework for Independent Review Process, to name a few. Public consultations are to be undertaken before any changes are made to either standard bylaws or fundamental bylaws. Changes to fundamental bylaws would additionally require a 75% approval from the ICANN Board as well as approval from the community (which is measured by the approval of 4 or more SO/ACs and not more than one objection). 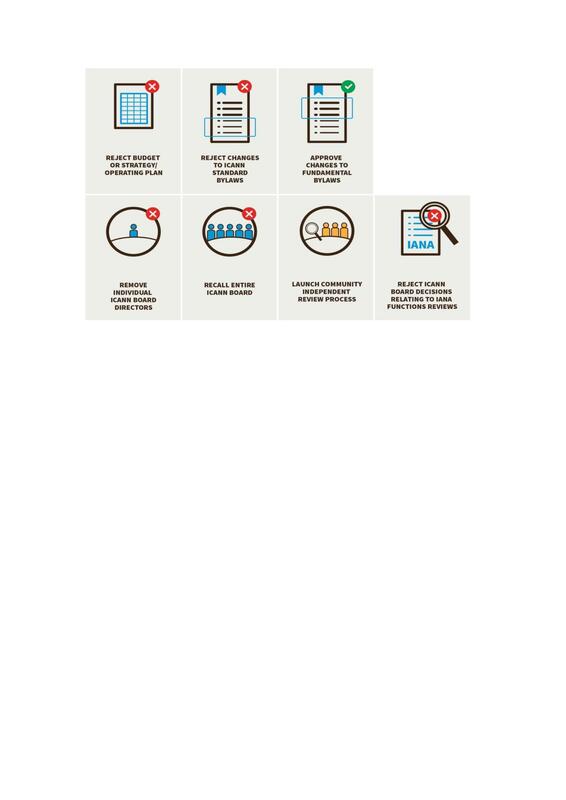 Source: CCWG- Accountability Draft Proposal on Work Stream 1 Recommendations, Annex 04, https://www.icann.org/en/system/files/files/draft-ccwg-accountability-proposal-annex-4-30nov15-en.pdf. While these powers are the same as those proposed in the previous draft, they have been restructured and all placed categorically under the same head of ‘Community Powers’ in this draft. The other change from the second proposal is that the process of engage, escalate, enforce must be triggered to use these powers. The escalation process is differs slightly for each power, and has been described in detail in Annexure 04. The CCWG-Accountability recommends amending the bylaw language to ensure that ICANN’s Mission, Commitments and Core Values correspond with the accountability and transparency recommendations made in the proposal. With that in mind, there are some clarifications to the Mission Statement, the Core Values have been divided into ‘Commitments’ and ‘Core Values’, and a Balancing Test has been proposed, which shall take public interest into account when reconciling competing Core Values. The revised Mission Statement, Commitments and Core Values are to be constituted as Fundamental Bylaws. This recommendation will be introduced through two bylaws: one, the draft Bylaw which clarifies ICANN’s obligation to respect internationally recognized human rights, and the other, an interim bylaw that commits to the development of a framework of interpretation for the implementation of the draft bylaw. The interim bylaw will exist only until the framework for interpretation is published as a part of Work stream 2. Other operationalization measures have been identified and reserved for Work Stream 2, such as deciding which Human Rights instrument should be used to interpret the draft bylaw and considering policies required to further enhance this commitment to human rights. The Independent Review Process is a process to ensure that ICANN does not act beyond its Mission, and complies with its Articles of Incorporation and bylaws. An aggrieved party can trigger the process by filing a complaint with the Independent Review Process panel. It is recommended that the decision at the end of the process is binding on ICANN. There are no new changes proposed in this draft; the enhancements provided in the previous drafts still stand, with the aim of ensuring that the IRP produces consistent and coherent results and the process is more accessible, affordable, transparent and efficient. The Request for Reconsideration process is already provided for in the ICANN bylaws, to allow any person or entity to submit a request for the review of an ICANN action or inaction. CCWG-Accountability has proposed several measures to fortify this process, such as expanding the scope of permissible requests, increasing the time for filing such requests and transparency-enhancing measures in the decision-making process. The Document and Information Disclosure Policy (DIDP) shall be discussed in Work Stream 2. These recommendations have not been changed since the previous draft proposal. The Affirmation of Commitments (AoC) is a 2009 bilateral agreement between ICANN and the NTIA. After the termination of the IANA agreement, the AoC will be the next target for elimination, as it is the last vestige of NTIA oversight. While the elimination of the agreement is simple enough (can be terminated by either party after giving 120-days’ notice), there are some provisions that are worth preserving. To do so, the CCWG-Accountability recommends adding certain ICANN commitments from the AoC to the bylaws. This also includes four types of review processes, to ensure that Community Reviews is an integral part of the accountability and transparency framework. Following the adoption of these new bylaws, it is recommended that the AoC be mutually terminated. A major change in this draft proposal is the recommendation that Section 8b (Article XVIII of the existing bylaws, which states that the principal office of ICANN shall remain in California) not be made a fundamental bylaw, but incorporated as a standard bylaw. This provides greater flexibility, should ICANN’s location ever be changed. In the Post-transition ICANN, SOs and ACs will have several new powers as part of the Empowered Community. Therefore, it was deemed necessary to ensure that these organisations are accountable and transparent themselves. In Work Stream 1, this will be achieved by including the review of SO/AC accountability mechanisms in the independent structural reviews performed regularly. However, the bulk of this discussion shall take place in Work Stream 2, including the proposal to add SO/AC accountability to the Accountability and Transparency Review Process. This is arguably the most contested recommendation in the third draft proposal. The Governmental Advisory Committee (GAC) has a special advisory status, which manifests in how the ICANN Board considers GAC advice. As per Article XI of the bylaws, if the Board takes a decision inconsistent with any GAC advice, it must state in writing the reasons for doing so, and then work with GAC to find a mutually acceptable solution. Stress Test 18 considers a scenario where the GAC changes its decision making process from consensus to majority voting. In such a scenario, the Board would be obligated to find a mutually acceptable solution even if the GAC advice achieved only a majority of votes. To mitigate these concerns, CCWG-Accountability recommended certain changes in the previous proposal, which have since been thoroughly debated and modified for the third proposal. In the present draft, it is recommended that Article XI be modified to require trying to find a mutually acceptable solution only for advice supported by a full GAC consensus, and describes consensus to mean general agreement in the absence of formal objection, be included in Article XI. The Board can agree, through a 2/3rds majority, to not to follow this advice. This does not modify GAC’s ability to give advice at any time. CCWG-Accountability proposes certain accountability topics for Work Stream 2- a timeline that extends beyond the IANA transition. These topics include mechanisms to enhance ICANN’s transparency, improve diversity at all levels, jurisdiction and accountability, developing a framework of interpretation for draft bylaw on human rights, and enhancing the Ombudsman’s role and function. The framework for interpretation and expanded transparency issues are the additions made in this draft. An interim bylaw committing ICANN to implementing CCWG-Accountability Work Stream 2 recommendations has also been proposed. This recommendation is of particular importance, as it sets the stage for Work Stream 2, calming concerns about lack of incentive to implement accountability proposals post the transition. The finalized WS2 proposals are expected to be delivered for approval to the Chartering Organizations by the end of June 2017. The proposed community powers consist of 7 powers, which are further dealt with under Recommendation #4. CCWG- Accountability Draft Proposal on Work Stream 1 Recommendations, Annex 02, p 11, available at https://www.icann.org/en/system/files/files/draft-ccwg-accountability-proposal-annex-2-30nov15-en.pdf. CCWG- Accountability Draft Proposal on Work Stream 1 Recommendations, Annex 05, p 6, available at https://www.icann.org/en/system/files/files/draft-ccwg-accountability-proposal-annex-5-30nov15-en.pdf. Tagged Accountability, CCWG, IANA transition, ICANN, and Internet govenance. Wow, awesome weblog layout! How long have you been blogging for? you made running a blog glance easy. The full glance of your site is excellent, let alone the content!